The Battle of Aughrim (Irish: Cath Eachroma) was the decisive battle of the Williamite War in Ireland. It was fought between the largely Irish Jacobite army loyal to James II and the forces of William III on 12 July 1691 (old style, equivalent to 22 July new style), near the village of Aughrim, County Galway. The battle was the bloodiest ever fought on Irish soil; over 7,000 people were killed. The Jacobite defeat at Aughrim meant the effective end of James's cause in Ireland, although the city of Limerick held out until the autumn of 1691. By 1691, the Jacobites had adopted a defensive position. In the previous year they had retreated into Connacht behind the easily defensible line of the Shannon, with strongholds at Sligo, Athlone and Limerick guarding the routes into the province. From this position, the Jacobites hoped to receive military aid from Louis XIV of France via the port towns and eventually be either in a position to retake the rest of Ireland or to negotiate a favourable peace settlement. 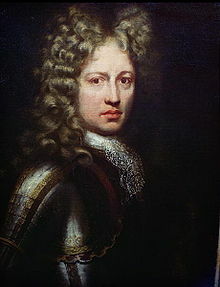 Neither William nor James was present in Ireland at this point and the campaign was conducted by their subordinates, Dutch officer Godert de Ginkel and French general the Marquis de St Ruth respectively. In May, both sides began assembling forces for a summer campaign, the Jacobites at Limerick and the Williamites at Mullingar. Ginkel breached the Jacobite line of defence by crossing the Shannon at Athlone: he took the town on 30th June after a bloody siege. Having mishandled the defence, St Ruth was unable to relieve the town and fell back to the west. Unaware of the location of St Ruth's main army and assuming he was outnumbered, Ginkel continued a cautious advance through Ballinasloe down the main Limerick and Galway road. St Ruth's initial plan, endorsed by James's viceroy Tyrconnell, had been to fall back on Limerick and force the Williamites into another year of campaigning, but wishing to redeem his errors at Athlone he appears to have instead decided to force a decisive battle. Ginkel found his way blocked by St Ruth’s army at Aughrim on the early morning of 12th of July 1691. At this point both armies were about 20,000 strong. The core of the Jacobite army was formed around James's old Royal Irish Army, which had been reorganised by Tyrconnell from 1686 onwards by dismissing the majority of Protestant officers and men. It had been substantially expanded with newly-recruited Irish Catholic regiments, organised in the English military tradition. While it is not now possible to establish with certainty which Jacobite regiments were present at Aughrim, 30 regiments of foot, including the Foot Guards, Talbot's, Nugent's, Fitzgerald's, Boffin's, Cormack O'Neill's, Saxby's and Iveagh's, can be identified as likely to have fought. The army also included a substantial force of around 4,000 cavalry and dragoons. Ginkel's army was drawn largely from amongst the members of William III’s League of Augsburg; its composition is much better documented than that of the Jacobites. In addition to English regiments, it included a large number of Anglo-Irish Protestants as well as Dutch, Danish and French Huguenot contingents. Different contemporary sources give different dispositions for Ginkel's forces at Aughrim, but most agree that the English and Anglo-Irish horse were on the right wing along with some Huguenot cavalry under Henri de Massue, with the left made up of Danish and French horse. The right centre was made up of English infantry and the left centre of French, Danish and Dutch. After heavy mist all morning, Ginkel's forces moved into position by about two o'clock in the afternoon, and both sides cannonaded each other for the next few hours. Ginkel planned to avoid fully joining battle until the next day; he ordered a probing attack on the Jacobites' weaker right flank led by a captain and sixteen Danish troopers, followed by 200 of Cunningham's Eniskillen dragoons. The Jacobite response demonstrated the strength of their defence, but also meant that the attackers were no longer able to break off the engagement as Ginkel had planned. A conference was held at about 4 pm: Ginkel still inclined towards trying to withdraw, but the Williamite infantry general Hugh Mackay argued for an immediate attack. Mackay's advice was to continue the attack at the Pass of Urachree in the hope St Ruth would transfer men from his left wing, weakening it. Battle was joined in earnest between five and six o'clock. In the centre, the Williamite foot under Mackay attempted a frontal assault on Dorrington's Jacobite infantry on Kilcommadan Hill. The Williamite troops, mainly English and Scots, had to contend with waist-deep water and a tenacious Irish defence of the reinforced hedgelines. They withdrew with heavy losses: the Jacobites pursued them downhill, capturing colonels Erle and Herbert. On their left centre, the Williamites advanced across low ground exposed to Jacobite fire and took a great number of casualties. The Williamite assault in this area, led by St John's and Tiffin's regiments and the Huguenot foot, was driven back into the bog by the Irish foot fighting with clubbed (reversed) muskets; many of the attackers were killed or drowned. In the rout, the pursuing Jacobites managed to spike a battery of Williamite guns. The Jacobite regiments of the Guards and Gordon O'Neill were said to have fought particularly strongly. The musketry was so intense, according to Andreas Claudianus, a Norwegian fighting with the Danish infantry, that "the ridges seemed to be ablaze". The Jacobite right and centre holding firm, Ginkel tried to force a way across the causeway on the Jacobite left. Any attack here would have to pass along a narrow lane covered by Walter Burke's regiment from their positions in Aughrim castle. Mackay directed a fourth assault, consisting mainly of cavalry, in two groups - one along the causeway and one parallel to the south. Burke's infantry stalled this attack with heavy fire from the castle, but then are supposed to have found that their reserve ammunition, which was British-made, would not fit into the muzzles of their French-supplied muskets; Dorrington had also earlier withdrawn two battalions of infantry from this area to reinforce the Jacobite centre. The Williamites then advanced again with a reasonably fresh regiment of cavalry under Henri de Massue and faced with only weak musket fire, Massue's troopers crossed the causeway and reached Aughrim village with few casualties. While a force of Jacobite cavalry and dragoons under Luttrell had been tasked with covering this flank, their commander ordered them to fall back, following a route now known locally as "Luttrell's Pass". He was later alleged to have been in the pay of William, and was assassinated in Dublin long after the war, though it seems most probable that Luttrell's dragoons simply withdrew as they had little or no infantry support. The Williamite cavalry then turned left of their line of advance, attacking Dorrington's flank. After the Jacobites' third infantry counterattack up to the enemy cannons, St Ruth appeared to believe that the battle could be won and was heard to shout, "they are running, we will chase them back to the gates of Dublin". Most commentators, even those sympathetic to William, judged that the Irish foot had fought exceptionally well, and some accounts including James II's Memoirs claim that St Ruth was "in a transport of joy to see the foot [...] behave themselves so well". At this point, St Ruth needed to deal with the immediate threat posed by the Williamite cavalry on his left wing. However, as he rode over to rally his cavalry on the left to counter-attack, he paused briefly to direct the fire of a battery, and was decapitated by a cannonball. His death was said to have occurred shortly after eight o'clock, around sunset. St Ruth had neglected to communicate his plan to his subordinates and after his death the Jacobite left, devoid of a senior commander, collapsed very quickly: St Ruth's bodyguard, the regiment of Horse Guards, left the field almost immediately, followed shortly by the cavalry and dragoon regiments of Luttrell, Sheldon and Galmoy. [b] With the projected cavalry counter-attack abandoned, St Ruth dead, de Tessé wounded, and Sarsfield still awaiting orders out of touch with the front line, the left flank was open for the Williamites to envelop the Jacobite line: Mackay and Tollemache also attacked again in the centre, pushing the Jacobites towards the hilltop. Burke and his regiment, still holding the castle, were forced to surrender. Most of the infantry remained unaware of St Ruth's death, however, and Hamilton's infantry on the Jacobite right continued to counter-attack, fighting the Huguenot foot to a standstill in an area still known locally as the "Bloody Hollow". However, towards nightfall, around nine o'clock, the Jacobite infantry were finally pushed to the top of Killcommadan hill and broke, fleeing towards a bog in the left rear of their position: their cavalry retreated towards Loughrea. Sarsfield and Galmoy briefly tried to organise a rearguard action but as in many battles of the period most of the Jacobite casualties occurred in the pursuit, which was ended only by darkness and the onset of mist and rain. The defeated infantry were cut down in their hundreds by the Williamite cavalry as they tried to get away, many of them having thrown away their weapons in order to run faster. In addition to the rank and file the Jacobite casualties and prisoners included many of its most experienced infantry officers: the dead included brigadiers Barker, O'Neill and O'Connell, and colonels Moore, Talbot, O'Mahony, Nugent, Felix O'Neil, and Ulick Burke, Lord Galway. Of the two major-generals commanding the Jacobite centre, Hamilton was killed and Dorrington captured. Though the killing of prisoners to prevent rescue was a common practice at the time, both sides afterwards accused each other of atrocities: Jacobite soldiers were said to have "cut to pieces" colonel Herbert after his capture. One contemporary Jacobite source (Leslie) alleged that about 2,000 Jacobites were killed "in cold blood" and that others, including Lord Galway and colonel Charles Moore, were killed after being promised quarter. An eyewitness with the Williamite army, George Story, wrote that "from the top of the Hill where [the Jacobite] Camp had been," the bodies "looked like a great Flock of Sheep, scattered up and down the Countrey for almost four Miles round." Estimates of the two armies' losses vary, but they were extremely heavy overall; it is generally agreed that about 5,000–7,000 men were killed at Aughrim. Allowing for poor recording of medieval battles, Aughrim has been described as "quite possibly the bloodiest battle ever fought in the British Isles". At the time, the Williamites claimed to have lost only 600 and to have killed fully 7,000 Jacobites. 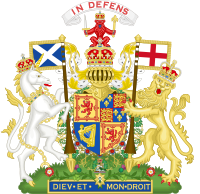 Some recent studies put the Williamite losses as high as 3,000, but they are more generally given as between 1,000–2,000, with 4,000 Jacobites killed. Another 4,000 Jacobites had either deserted or were taken prisoner: Ginkel recorded 526 prisoners taken of all ranks. While Ginkel had given word to Dorrington that the captives would be treated as prisoners of war, general officers were instead taken to the Tower of London as prisoners of state, while the majority of the rank and file were incarcerated on Lambay Island where many died of disease and starvation. Aughrim was the decisive battle of the conflict: many of the Jacobite dead were experienced officers, who would be impossible to replace, and the army had lost the better part of its equipment and supplies. The remnants of the Jacobite army retreated to the mountains before regrouping under Sarsfield's command at Limerick, where the defences were still in the process of being repaired. However, many of the Jacobite infantry regiments were seriously depleted: for example on 22 July, Bellew's regiment was listed as having 240 soldiers, and had lost all its senior officers and sergeants; Slane's regiment 140 soldiers, and Louth's just 28, although some stragglers arrived later. The city of Galway surrendered without a fight after the battle, on advantageous terms, while Sarsfield and the Jacobites' main army surrendered shortly afterwards at Limerick after a short siege. According to O Ciardha, the battle "made a searing impression on the Irish consciousness". It became known in Irish tradition, following a poem by Irish language poet Séamas Dall Mac Cuarta, the "Elegy for Sorley MacDonnell", as "Eachdhroim an áir" - "Aughrim of the slaughter". While Ginkel ordered the burial of his own dead and those Jacobites that lay on the ground where he wanted to pitch his own tents, the remaining Irish were left unburied, their bones remaining scattered on the battlefield for years afterwards. [c] Mac Cuarta wrote of the Irish dead, "It is at Aughrim of the slaughter where they are to be found, their damp bones lying uncoffined". John Dunton in his work Teague Land, an account of his travels in Ireland written seven years after the battle, wrote that: "After the battle the English did not tarry to bury any of the dead but their own, and left those of the enemy exposed to the fowls of the air, for the country was then so uninhabited that there were not hands to inter them. Many dogs resorted to this aceldama where for want of other food they fed on man's flesh, and thereby became so dangerous and fierce that a single person could not pass that way without manifest hazard". He ends the description with the story of a faithful greyhound belonging to a Jacobite killed in the battle who remained by his master's body defending it until shot by a passing soldier in January of the following year. While Aughrim remained a powerful symbol of disaster for Irish Catholics, it was also the focus of Loyalist (particularly Orange Order) celebrations in Ireland on 12 July up until the early 19th century. Thereafter, it was superseded by the Battle of the Boyne in commemorations on "the Twelfth" due to the switch to the Gregorian calendar (in which 1 July OS became 11 July NS and 12 July OS became 22 July NS). It has also been suggested that the Boyne became emphasised because the Irish troops could be more easily presented as cowardly than at Aughrim, where they were generally agreed to have fought bravely. The Loyalist song The Sash mentions Aughrim. The battle was the subject of a 1728 tragic drama by Robert Ashton, The Battle of Aughrim or the Fall of Monsieur St Ruth, which after initial neglect became enormously popular from 1770 onwards into the 19th century. Though the play was intended to celebrate the Williamite victory, and casts St Ruth firmly in the role of antagonist, it also presents Sarsfield and his lieutenants sympathetically as epic figures and incorporates a "lament for Catholic patriotism", so that "both Catholics and Protestants were attracted to the play for generations". In 1804 it was noted of Ashton's play that "a more popular Production never appeared in Ireland; it is in the hands of every Peasant who can read English; and [...] is committed to memory and occasionally recited". In 1885, artist John Mulvany completed a painting of the battle; it was exhibited in Dublin in 2010. The Battle of Aughrim was also the subject of a long 1968 poem by Richard Murphy, who noted that he had ancestors fighting on both sides. The Aughrim battlefield site became the subject of controversy in Ireland over plans to build the new M6 motorway through the former battlefield. Historians, environmentalists and members of the Orange Order objected to the plans; the motorway opened in 2009. The Battle of Aughrim Interpretative Centre, in Aughrim village was opened in 1991. It is a collaboration between Aughrim Heritage Committee, Ireland West Tourism, and Galway County Council. It houses artefacts found on the battlefield site, as well as three-dimensional displays and a documentary film that explains the course of the battle and its significance in the wider context of the history of Ireland. ^ Two accounts, that given in Jacobite tract A Light to the Blind and in Macariae Excidium, place Sarsfield on the right with de Tessé and on the left respectively. The account of Robert Parker, who fought at the battle, claims that Sarsfield was with the reserve at the rear: this is generally seen as accurate as he is not mentioned in any narrative of the battle until the retreat (see Hayes-McCoy (1942), 18). ^ Modern scholarly opinion is divided on the significance of St Ruth's death, as the critical breakthrough on the Jacobite left occurred prior to it: even at the time the Duke of Berwick suggested the battle would have been lost even if St Ruth had lived. ^ At least some were later collected: Sir Thomas Molyneux, 1st Baronet, a visitor to Kilconnell Friary in 1709, noted that the churchyard was then "surrounded by a wall of dead men’s sckulls and bones pil’d very orderly [...] clear round against the wall to the length of 88 foot [...] within they shew you Ld. Gallway’s and other great men’s heads killed at Aghrim". The local landlord appears to have finally arranged burial in the 1860s. ^ Hayes-McCoy, Gerard Anthony (1964). The Irish at war. Mercier Press. p. 55. ^ Grant, James (1873). British battles on land and sea, Volume 1. Cassell, Petter, Galpin. p. 417. ^ McCoy, p267 gives the Jacobite losses as 4,000 killed, with 2,000 Williamite troops dead. ^ Padraig Lenihan in Consolidating Conquest, Ireland 1603-1727, p186, gives the losses as, "one fifth of the estimated 20,000 strong Irish army and at least 1,200 Allies killed in the opening attacks"
^ Padraig Lenihan, The Battle of the Boyne, p258-259, "The 18th-century anniversaries of the Boyne and Aughrim served as the focus of more plebeian commemorations that included bonfires and parading. In this context, the 'twelfth' was the most symbolically important battle commemoration but it referred to Aughrim. Until Britain belatedly adopted the Gregorian Calendar in 1752, 1 July was the anniversary of the Boyne and 12 July the anniversary of Aughrim." "Aughrim emphasises the valour and martial qualities of the Jacobites with a view to magnify the military achievement and bravery of the Williamites...This depiction of Jacobites, favourable in many respects, may have been less suitable to Protestant communal rituals in the face of a post-1790s Catholic resurgence." ^ "Battle of Aughrim Centre". Galway County Council. Retrieved 24 April 2016. ^ "Remembering Aughrim, July 21, 1691". Galway Advertiser, July 24th, 1997. Retrieved 24 April 2016. Piers Waudchope, Patrick Sarsfield and the Williamite War, Dublin 1992. J.G. Simms, Jacobite Ireland, London 1969. G.A., Hayes McCoy, Irish Battles, Belfast 1990. Eamonn O Ciardha, Ireland and the Jacobite cause - a Fatal Attachment, Dublin 2002. Padraig Lenihan, 1690, Battle of the Boyne, Tempus, 2003. Interview with historian Padraig Lenihan on the battle.